Curiously, I was actually already awake by the time the alarm clock sounded at 03:30 this morning. Not entirely sure why it’s necessary to be at the airport a full 3 hours prior to departure but that’s what we’ve been told. With most of the luggage already in the car, we made swift work of getting organised and, finally, loading the kids into the car - still in their pyjamas and tucked up nicely beneath a blanket. The nice thing about travelling at stupid o’clock in the morning is the fact that the roads are empty, and so we made it without incident to the parking facility a couple of Kilometres outside the airport. It seems that this is a busy time of the year for travel because the parking facility was bursting at the seams. Indeed, the check-in clerk told me that they were completely full, which makes me glad that I had the forethought to book ahead of time. So, having been relieved of just under $100 to park the car for a week, the parking operator’s shuttle bus dropped us off at the airport and I immediately ignored the paid trolley stations outside the main terminal building. We had wasted several Dollars on these last year when we realised that people leave then trolleys laying around right after checking in their luggage. I went into the terminal building and, sure enough, had no trouble locating any of several dozen ‘free’ trolleys. So, with kids and luggage in tow, we located the correct check-in desk and rocked up. Nobody was there. I don’t mean that there were no other passengers queuing to check-in, I mean that there was nobody manning the desks. Apparently, according to a Virgin rep we found manning a Customer Service booth, the check-in desks won’t open for another hour and a half. Somewhat frustrating but this at least gave us time to have a relaxed breakfast. As luck would have it, the check-in desks did actually open just as we were all polishing off our rather delicious cooked breakfast. ￼We ended up being the first in the check-in queue and the formalities were swiftly dealt with. Being a Dutch citizen, Sandy’s passport contains her maiden name as well as her married name and I had previously been apprehensive about this causing difficulties, especially since the tickets were booked under the family name of Morgan. I had previously called Virgin Customer Service to ask about this and they had told me that it wouldn’t be a problem and that they would simply make a note in the system. When Sandy’s passport was scanned, it came up with her maiden name and the check-in clerk initially queried this. Just as I was about to go into a whole diatribe about having previously contacted Virgin about this, the clerk simply said that she would change the name on the itinerary and that was the end of it. All sorted with no fuss. The last time we were here at Melbourne International airport, the queues at security and immigration were horrendous. By now, Joey was already starting to exhibit his ‘grumpy’ tendencies, as is often the case when he is apprehensive about something new. In an attempt to forestall a potentially difficult time getting through the airport, I decided to risk pulling out the ‘special needs’ card and asked if we might be allowed to bypass the queues due to our kids’ special needs. The check-in clerk made a phone call and, after we had completed our departure cards, our flight supervisor was summonsed and we were then personally escorted through security, immigration and all the way through to our departure gate at the far end of the airport terminal building. ￼The supervisor was really good with us and the kids and even told us that she would personally come and get us onto the plane when the time came. We felt like we were really getting the best customer service possible. We’re now parked at the departure gate with almost nobody around and an hour and a half to kill before boarding. So far, then, so good. Ok, here’s quick update from the flight. We’re over the open ocean at the moment with around another 3 hours of flying time ahead of us still. We not long ago passed directly over Sydney, providing those of us on the left side of the plane with a smashing view of Sydney Harbour. 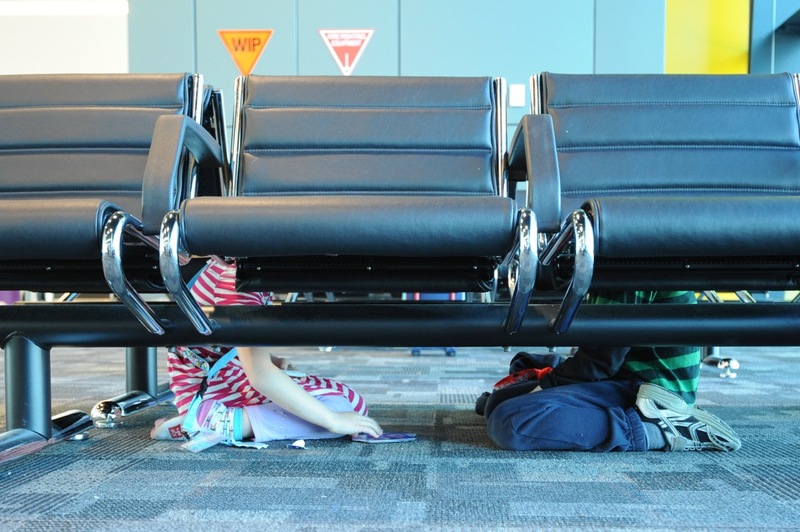 We had hoped that the kids might get a little shut-eye on the plane but, alas, no such luck. They’ve been buzzing ever since we left the house. As expected, Lana, my work colleague is also on the flight and we caught up shortly before getting on the plane. She clearly got to the airport much later than we did and seemed a bit more flustered and rushed for it. Still, we’re all aboard now and can all relax. The flight is chock full of families. When the announcement was made for people with small children to board already, pretty much everyone stood up and a long queue immediately formed. That same supervisor that was going to ensure that we got onto the plane was tending to an unaccompanied minor but we ended up very close to the front of the queue anyway so it really didn’t matter. Very slowly, thoughts are now starting to turn to what it will be like in Fiji. For the next few hours, however, I’m going to try to tuck into Calculus book - yes, it relaxes me.